To The Batpoles! Batman 1966: #064 Bat-manga! 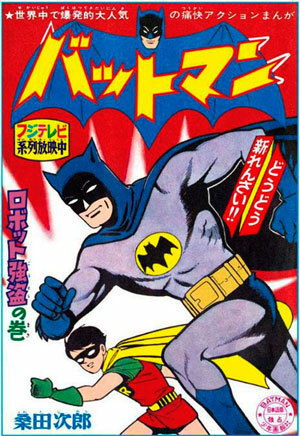 In 1966, the Batman TV show was big in numerous countries, including Tim’s adopted home of Japan, where it led to the licensed creation of a series of Japanese Batman comics. While the purpose of the comics (written and drawn by Jiro Kuwata) was to cash in on the show’s popularity, the stories are based on Batman comics of the early ‘60s and before, though often greatly decompressed, with added elements, and sometimes just freeform weirdness. In this episode, manga translator Kumar Sivasubramanian joins Tim and Paul to dig into the series — its influences, how it compares to the show and to the source-material comics, and a comparison of the 2008 Chip Kidd art book on the topic vs. the subsequent full publication of the ‘60s series in English — which is more worth your time? ALSO: The Sheena and the Rokkets version of the theme, a plot glitch in “Batman’s Satisfaction” that we somehow missed, and your mail! Which Batman scripts should we get to talk about?